Thirdy Ravena was on top of the world. He ended his High School career without a championship and lost in the SLAM Rising Stars Classic versus the Hubert Cani-led Team Hype. 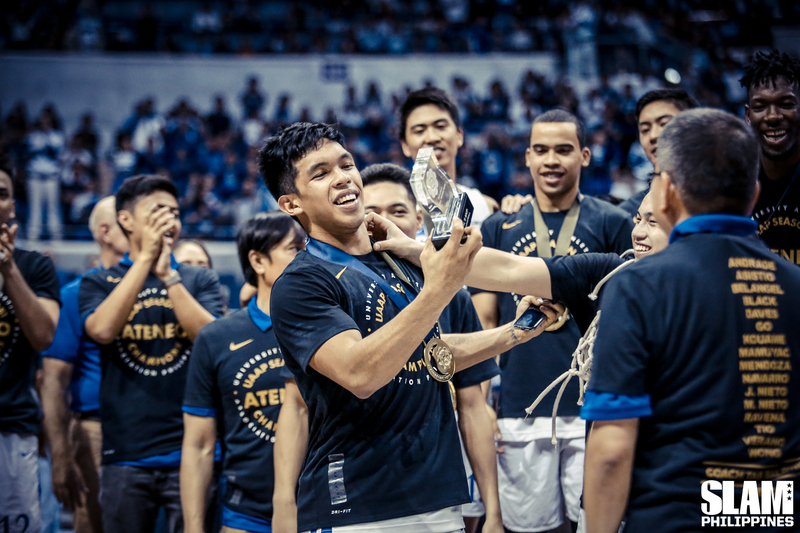 But all that mattered was he had established himself as a bluechip recruit worthy to be talked about alongside his brother Kiefer and father Bong after winning a Juniors MVP in Season 76, notching triple-doubles left and right. Many called him a college-ready prospect. Thirdy himself believed that as well. “I was the MVP in High School, I thought to myself na, I think I might have an easier time adjusting in college basketball,” said Thirdy. Call it self-confidence, arrogance, it didn’t matter, Thirdy thought he was ready. But life was also ready to slap him hard back to reality. In his first game in the Seniors Division, he flamed out. He failed to scored and committed four fouls in seven minutes. It was easy to chalk it up to rookie jitters, especially considering how his brother also went scoreless in his first game. But this was different, as his struggles continued over the course of the season. He went scoreless in his next two games and didn’t even see the court in his fifth game. The trend continued, as Ravena only averaged 1.3 points and 1.6 rebounds per game to end his first season in the Seniors Division. Bust. Overrated. Hanggang pangalan lang. Things didn’t get any easier for Thirdy. During the summer of 2015, Thirdy was deemed ineligible by Ateneo to play in Season 78 due to grades. It was a huge blow to his career, from being at the top of the world just a few years ago, he suddenly hit rock bottom. 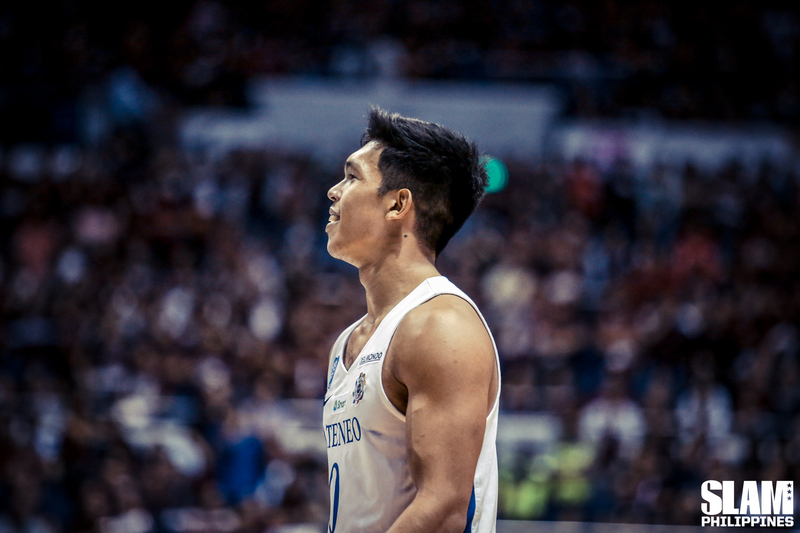 “It was a good time for Thirdy to take a step back, to see the game at a different perspective, different point of view,” his brother Kiefer recalled. Not being part of the team allowed him to focus on other aspects of his life. He hit the books and got to spend more time with his family. In Filipino culture, the household is considered a refuge, a safe space. But the Ravena’s nest was different. It was a factory of athletes built to develop better players and persons. His father and mother are legends in their own fields. His brother Kiefer is a two-time MVP, while his sister Dani was starting to establish herself in volleyball. Thirdy spent more time with his family, where nothing easy was given to him. As decorated as Bong and Kiefer were, it wasn’t crazy to say Thirdy was the most physically gifted out of the three. It’s as if Kiefer and Bong fused together in this video game created player. He had the build of a great wing, but thanks to his opportunities with the Blue Eaglets, he had the chance to go beyond the limits of the position. Coach Joe Silva’s system allowed Thirdy to play multiple positions. There would be instances he’d play even the power forward position thanks to his strength and athleticism. But most of the time, he played as a playmaking forward, who often relied on the gravity of his drives to create for others. He came into college with the same mindset he had in high school. There were plenty of instances during his rookie year where he forced things, relying too much on his natural gifts rather than using his mind to reign in his physical tools. It was understandable that he wanted to dominate from the get go. He had high standards to live up to. Kiefer is an anomaly because of his basketball IQ. Coach Sandy Arespacochaga even went as far as to describe him as a basketball genius. The game came naturally to him. He was Mamba Mentality personified, from the very moment he came into the Seniors Division. Thirdy was different. What was natural for him were his long arms, wide frame, and extraordinary leaping ability. It was his basketaball IQ that needed work. If you were to ask Kiefer, the only thing he believed he had over his brother was IQ. The rest, he conceded to Thirdy. He knew that Thirdy just needed to realize that and put everything together. Thirdy’s improvement started to show in Season 79. He returned to the team ready to lead. He had a bigger body and improved a lot of facets to his game. He still used his raw, physical force to get things done. And that’s why the Blue Eagles made a surprise trip to the Finals. Because Thirdy powered them to wins. His redemption tour didn’t end with a championship. The same problems he had before his one-season break came back to plague him at the worst time. With 30 seconds left on the clock, Thirdy had the chance to deliver a dagger to the heavily-favored DLSU Green Archers in Game 1 of the Finals. He found himself isolated in the top of the key against Kib Montalbo. Thirdy had the option to give the ball to Matt Nieto who was red hot at that time. Instead, he attacked by himself. The problem was, it was a predictable move, and Kib read it perfectly. He stripped Ravena and La Salle closed out Game 1 with a clutch basket from Jeron Teng. It was even worse in Game 2. Thirdy struggled all game long, he missed all his attempts, scoring only three points in the close out game. It was a nightmare performance from Thirdy in his first Finals appearance. At the end of the day, he needed this, all of this for his growth. As a college player, the learning has to be continuous. In Thirdy’s case, it helped he had the best teacher helping him out in his journey, Coach Tab Baldwin “He’s really tremendous for our development,” said Thirdy praising his coach. A lot has been said about Thirdy’s growth physically, but what’s underrated was the development of his basketball IQ. While Thirdy has always been a quick and eager learner, but having a mentor like Coach Tab changed things for him. Most of Ravena’s errors came from relying too much on his physical gifts. Even in Season 80 as he blossomed into an even more consistent player, he still had moments where he would revert back to playing bully ball. There were moments where he would force a drive or dribble too long and settle for a bad shot. These moments served as more opportunities for him to learn. It probably felt repetitive to have his coaches remind him to not force the issue during the clutch. But the Ateneo coaches were more than willing to keep on instilling a new mindset into their superstar. It also helps Thirdy himself made it a habit to study tape with some pretty talented players. “He studies tape with his brother and father, and he analyzes each everything on offense and defense,” said coach Joe. The process was continuous for Thirdy. Make a mistake, learn from tape, apply in the next game. 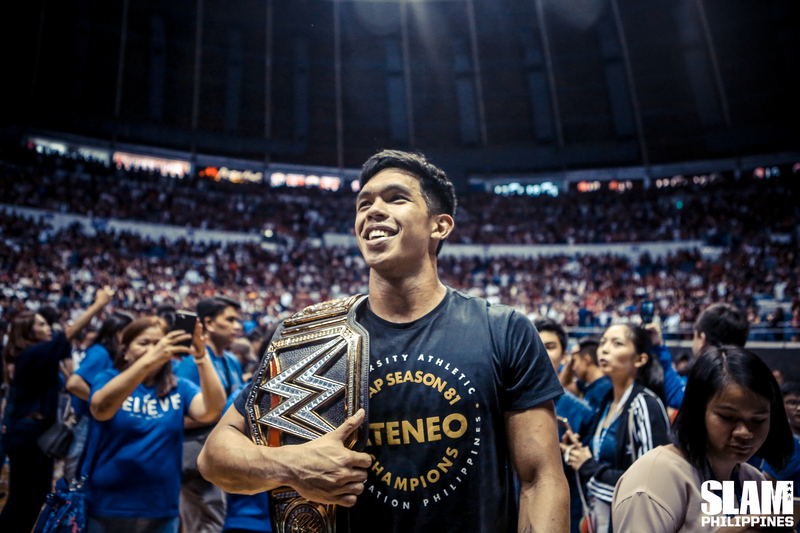 While it’s easy to believe everyone witnessed the peak of his powers in his Finals MVP run in Season 80, the reality was, things were only getting better for Thirdy. He proved it this season. Thirdy made a name for himself this season as a Human Highlight Reel. He had a ton of dunks and chase down blocks on almost every team he played against. But digging deeper will reveal how much he’s improved from in terms of his basketball IQ and knowledge of the Ateneo system. He’s a freak of nature physically, and aiding him was his mind processing everything that was happening on the court he was playing in. It all boils down to one thing: control. Thirdy’s length and athleticism has always made him a weapon in the open court. Extraordinarily long strides allow him to go coast to coast faster than anyone else, scoring easily in such situations. But he’s gone beyond that. For instance, in this play in Game 1 of the Finals, he led this fast break perfectly. He got the rebound, and then on the jets. But even while running down the court he put his teammates into position, asking Mike Nieto to cut, and Ange Kouame to dive to the rim. This move created a domino effect. The defense built a wall not just because of the impending Thirdy drive, but also the possibility of a diving Ange. That’s three players on two guys. One player is bound to be free, and that was Mike. That was Thirdy thinking two plays ahead. What was impressive about this play was Thirdy’s ability to create decisions on the fly, in the open court. His mindset used to be attack, attack, attack. Turn on the jets, go to the rim, and either get a bucket or draw a foul. This season he’s embraced the unique skill of making passes even though he’s attacking at a speed meant to score. In this play, he made his attack with a stutter step to try and elude his defender, only to suddenly explode forward. It seemed like there were only two options for him; drive and hope he somehow scores, or kick out to Gian Mamuyac in the right corner. Instead, he recognized the trailing Ange and calmly dished him the rock for a dunk. The dunk was electrifying. The pass, even more so. 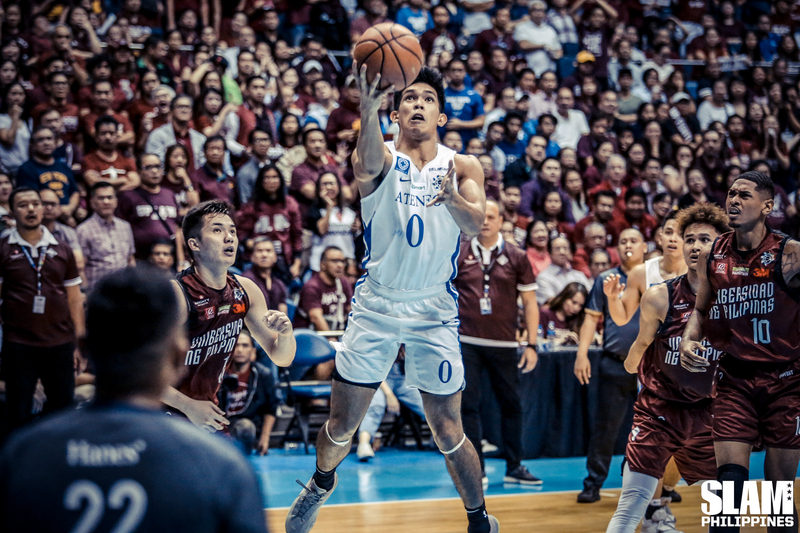 While Thirdy’s open court exploits are understandable considering his tools, his complete growth is most seen with how he handles himself in the half court. In the Finals, the biggest stage moment all season, Coach Tab trusted Thirdy to be his lead playmaker. He repaid the trust of his coach and was in absolute control of the game. Thirdy knew where his teammates would be and he in turn trusted them to make the right moves around him. He dished out passes with the flash he’s always been associated with, and control unlike anyone has seen before form him. 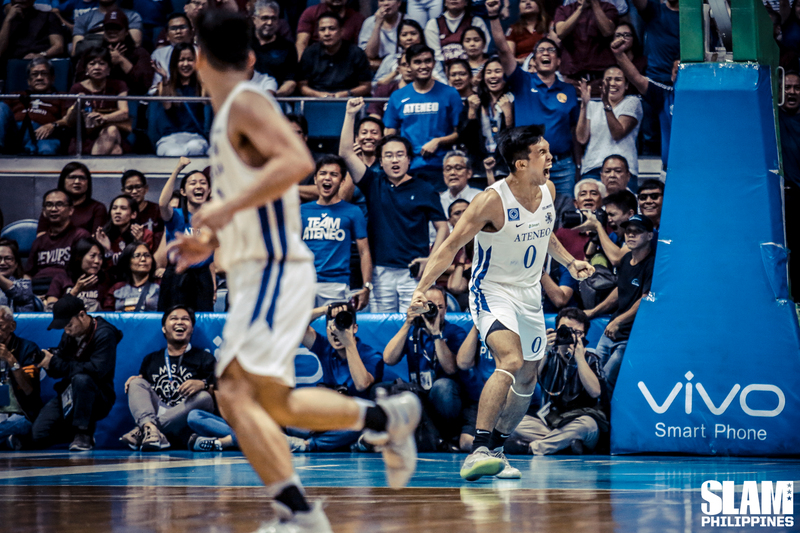 The Blue Eagles have been regarded as this bastion of ball movement, but the reality of it is, they play isolation more than anyone realizes. “We have isolation plays, but there’s a reason. It’s still part of the system,” said coach Sandy. Most glaring this season has been the extensive use of the ball screen in initiating the attacks of the Blue Eagles. 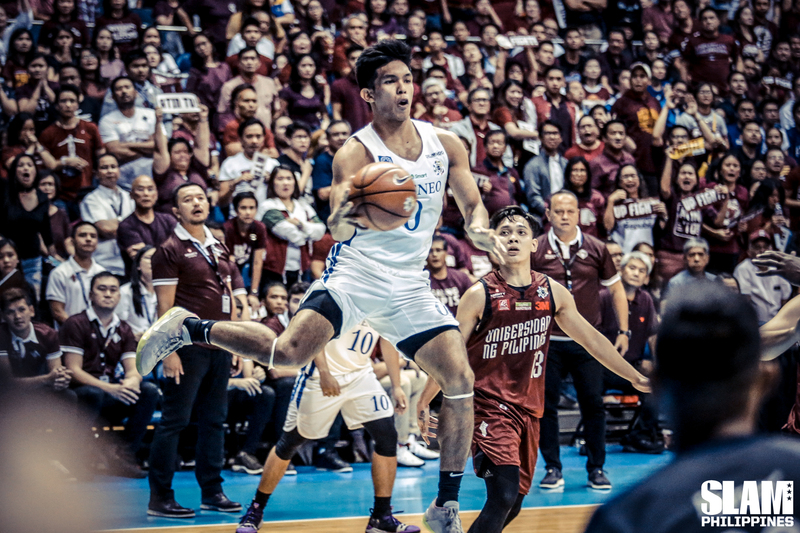 Matt Nieto, Tyler Tio and even SJ Belenage executed this well. During the Finals, Thirdy used this just as well as his point guards. It all started with the development of Thirdy’s jumper. He’s never been a good shooter, whether it be from beyond the arc or from midrange. But during the 2018 offseason, he started to showcase flashes of midrange brilliance. It continued during the course of the regular season, then to the surprise of many, he kicked it up to another level come the Finals. Before, he’d often take these shots with hesitation, thus killing the momentum of his movements. He’d either rely on the jump too much, or pause and overcompensate with his strength when he’d shoot the ball. It wasn’t surprising to see most of his threes hit back iron most of the time. In the Season 81 Finals, Thirdy was shooting in the flow of the system, not settling for bail out jumpers. He was pulling up, with confidence and purpose. His improved jumper came from his ability to control the game. He managed to use speed to aid his pull-up, making defenders think twice about what move he’d pull off, giving him space to shoot the ball. “It’s very hard to guard Thirdy. Are you going to help off him and sacrifice the open shot for another player? Or just let him go one on one?” said Coach Sandy. UP simply did not have the answer for Thirdy. If there’s one play that captured Thirdy’s growth this season, it’s. He initiated the attack and saw that there wasn’t an opportunity to drive. So he passed it off to Matt in the opposite wing. Thirdy stayed on his toes, knees bent, ready to attack or pull-up when the opportunity presented itself. The initial pass had a purpose. Staying in that wing had its reason. Matt dished it back, Thirdy caught the ball, and pulled-up, all in one quick motion. Take a look at the numbers: 29.5 points, 8.0 rebounds, 7.5 assists and 2.5 steals per game. That was a masterclass by Thirdy in the Season 81 Finals. That was type of performance that’s certainly of the best in UAAP history. His scoring was stupendous, but what was even more amazing was his absolute control of the game. In fact, while he finished with a Finals-best 38 points during the closeout game, coach Sandy did not even feel it at that moment. Just like his brother? Far from it. This was a performance that only Thirdy could put up, a showcase of his athleticism, and most importantly, IQ as a player. Kiefer said so himself, the only advantage he had against Thirdy was IQ. Now, it looks like Thirdy is catching up in that department. He’s on top of the world once more, but even better than how he was after High School. He’s an elite prospect, while also being a back to back champion, and a two-time Finals MVP. But it doesn’t stop here for Thirdy. For now, he’ll celebrate, take a break as he basks in his glory as a champion. But come January, it’s back to the lab. He made mistakes, tape will be studied, then he’ll apply.